Mercedes-Benz has officially released details on the all-new 2013 CLS Shooting Brake. While we have known for some time that Mercedes-Benz was going to bring out the new 2013 CLS Shooting Brake, the German automaker has made it official and has released full details on the new wagon. The CLS Shooting Brake is based on the CLS coupe and is unlike any other car on the market. Mercedes says the new CLS Shooting Brake proportions are “clearly those of a coupe,” and while the wagon has the long hood, narrow frameless side windows and raked roof that slopes to the rear, it still has four doors and a tailgate. Mercedes would have us believe the new CLS Shooting Brake is a “sports car with five seats and a tailgate.” And in Europe the new sports wagon will likely been seen that way. Wagons have been popular in Europe for decades and the 2013 CLS Shooting Brake should be a big hit overseas, but don’t look for the sport wagon to make it to the U.S. anytime soon. Currently, Mercedes-Benz has no plans to bring the CLS Shooting Brake to the U.S. And it’s probably a good idea as Americans have yet to widely embrace the wagon as a luxury sport vehicle. Americans are still attached to their large SUV’s. The new CLS from Mercedes is a lot like the Cadillac CTS Wagon and similar in execution. The coupe-like wagon is actually a great idea when you look at the functionality of the vehicle. The four-door Shooting Brake has a large load-carrying cargo area (54.7 cubic feet) and features a standard automatic opening tailgate for convenience. The rear seats also fold flat for extra cargo carrying ability. The quality of the interior is unsurpassed and the rear even comes with a Cherry tree wood luggage compartment floor. It is contrasted by the use of inlaid smoked oak and aluminum rails. The CLS Shooting Brake offers luxury with practicality. You might wonder where the new wagon gets its name. “Break, or the homonym Brake, was the name once given to carriages used to "break" in wild horses and also to restrict (or "brake") their urge to move, so that they could be put to use as work horses. Since the carts could easily be broken as part of this process, people tended not to use ones which they may have urgently needed for other purposes." The 2013 CLS Shooting Brake should be a great car to drive. In Europe, the new wagon will feature two gasoline engines, a 3.5-liter V6 making 306 horsepower in the CLS350 and a high-performance 408-horsepower twin-turbo 4.6-liter V8 in the CLS500. The car will also be available with the choice of two diesels, a 2.1-liter four cylinder in the CLS250 CDI and a 3.0-liter V6 in the CLS350 CDI. All but the four-cylinder are available with either rear-or 4Matic all-wheel drive, the smallest engine will come with rear-drive only. Acceleration comes in at 7.8 seconds to 62 miles per hour for the CLS250 CDI, 6.7 seconds for the CLS350 and 5.3 for the CLS500. Top speed is limited to 155 mph. Not bad for a family grocery hauler. It’s a shame Americans haven’t embraced the sport-wagon. 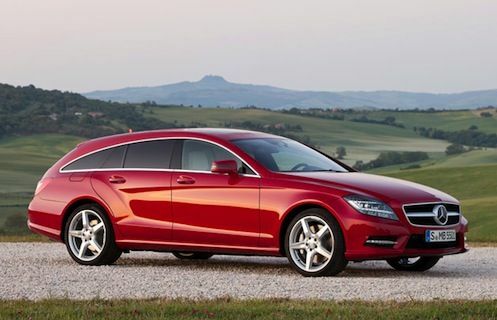 The 2013 Mercedes-Benz CLS Shooting Brake is a great idea for someone wanting a sporty functional vehicle. Check out the CLS Shooting Brake video below.